Frank Gallagher and his team of multi-hull sailors — Ben Arthur, Yates Dowell, and Jim Antonovich ran the races. The tide was in. So to save the sailors from going all the way up river, the RC ran the races off of the power plant. Does someone who was there want to add some comments? This past Sunday felt more like a professional training venue than a local club’s series. After a beautiful sunny and moderately breezy Saturday, I suspect Sunday’s forecast of rain and either too little or too much wind kept many sailors away. In reality, we experienced little to no rain while racing, enough wind for three competitive races, and began to receive the predicted gusts for the sail home. The three lone participants (Farley, Barney, and myself) received unwavering attention from our two support boats. An active RC squared the course, captured action shots, and even fed us beer bread! I can’t thank RC enough for holding a great day of racing. Competitors saw both triangle and olympic courses, which offered a welcome relief from a constant dead downwind wing-on-wing leeward leg. With just three boats, I focused on being on the line (or as near to it as I often dare – still working on that) and optimizing boat speed, while Marisa performed excellent compass work. We seemed to have just as good or better boatspeed and so I really worked at pointing higher than surrounding boats until I felt us start to slow down. Several of our passing maneuvers resulted from pure boat speed, while others from sailing in the lifts. All in all, it was a joy to be in our new boat Mega Woof and race against some stiff competition. The air was light to non-existent. John Van Voorhis, our PRO for the day, postponed on shore. After a while though the sailors got restless and with the promise that the wind would come in around 1 pm decided to make an attempt to sail up river. I thought those sailors were far too optimistic but Jess, Tom, and I decided to go up to Gravelly Point with Shadowfax in tow and see if the wind would come in. After sitting on the shore for quite a while, with planes landing over our head, we finally saw the first boat appear around the point. Then we saw that there was indeed some wind coming up the river from the south. We got to work setting up Shadowfax and sailed south to where John had set up the course. We arrived in the starting area just as the first race was finishing up. Better late than never. Unfortunately, I discovered I had left our spinnaker at home. Argh. We did well upwind but then had to point straight downwind sailing wing and wing with our weight all the way forward. Meanwhile the other sailors set their spinnakers but had the problem of to trying to keep them full which was no easy task in the light air. Jeff Neurauter and Heather Howard on their Bucc figured it out and sailed past us. However, we were able to keep the others just behind us at the leeward mark. Bottom line, the wind was sufficient and it was a fun day of sailing! Never say die. The weather forecasts threatened rain and maybe even thunderstorms and the sky was gray. But guess what? No rain and the best breeze we’ve had all fall! It was a small group of 5 Lightning and 2 Buccs at the Albacores were at West River for their Nationals and neither the I-20s or Multi-Hulls were there. You guys missed out! The RC gave us four W-2 courses set up on a southwesterly axis. Jeff Neurauter, Heather Howard, Ben Arthur, and Ann Tyree ran race committee. Tom Hutton did the scores. Thanks! I am reposting this writeup from Geoff Bishop who finished in 3rd place in the Lightning class. Geoff was sailing with his daughter, Gigi, and son Quentin. This is only their 3rd time out on the Lightning. Great day to kick off the falls series. The sun was warm, the air was dry, the breeze was from the northeast (sort of) and varied from none at all to as much as 10 mph. The current was strong. The RC set up a triangle and signalled 3 O-2s and 1 W-3. Judging the time to the line. The start line was very pin favored and the current was ripping down the line against a traditional starboard tack approach. On Shadowfax, we decided to start the races on port at the pin. I knew the main threat would be from Bobby Astrove coming down the line on starboard. So we had to judge how long it would take him and us to get to the pin. Tom Hutton, in the middle, helped judge that time and called it. We crossed him once and ducked him twice but had a good start every time. In addition, it was clear that most of the other boats starting on port were getting to the line far too early and having to bear off down the line thereby losing a lot for every second early that got there. It is well worth practicing deciding how long it will take to get to the line and learning how to speed up or slow down to get there at the right time. By the way, in the first race Bobby could not get to the pin on starboard and at the gun he was roughly midway and tacked immediately. 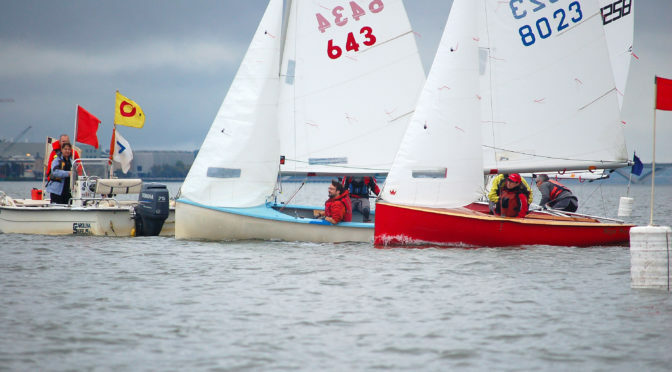 In at least, two of the following three races, he approached the line from above the committee boat and executed a beautiful dip start near the pin. Dip starts are risky because 1) leeward boats may not let you dip and 2) because you may not get yourself all the way below the line and get called OCS. So it take good judgement of what the other boats can do in the conditions and of where you are relative to the line. When in doubt sail the long tack to the mark. The wind was spotty and shifty and so it was difficult to decide whether to go off to the right and try to get a puff coming down the Anacostia or go left and toward that puff coming down from the north. We found that if we simply sailed the tack that was lifting us to the mark, we did very well. So although it always pays to look for the breeze and try to get there, when in doubt simply sail the longer tack toward the mark. Related to this lesson was a case of bad luck for us or good strategy by John Van Voorhis. John was on starboard maybe 10 boat lengths from the windward mark but not fetching by a couple of boat lengths . We were approaching him on port. Our plan was to duck him, tack onto starboard on the layline and force him to duck us as we approached and rounded the mark. Good in theory, but just after we tacked the wind shifted left. Now we were headed and not fetching the mark. He tacked to the lifted port tack and made the pin many boat lengths ahead of us. He was sailing the long tack to the mark and waited for a good shift. We sailed the short tack and had little choice of what to do when the shift came. Where to point when the wind dies. We were ahead of John Van Voorhis approaching the leeward mark when the wind went very soft. I kept steering at an increasingly hot angle trying to keep the spinnaker full. Not only did that not work because the wind simply wasn’t there, but I was going further away from the mark. In contrast, John Van Voorhis just pointed to the mark and the strong current I mentioned above took him past us. When there is current, consider simply using it when the wind dies.